The pending deal overcame the objections of House Speaker Paul Ryan (R-Wis.) to setting up an off-budget wildfire disaster fund, congressional sources said, clearing the way to end the Forest Service's practice of raiding non-fire-related accounts to pay for wildfire suppression. The agreement, described by Capitol Hill aides and lobbyists, would establish a fund of more than $2 billion a year, which would increase modestly over a 10-year period. 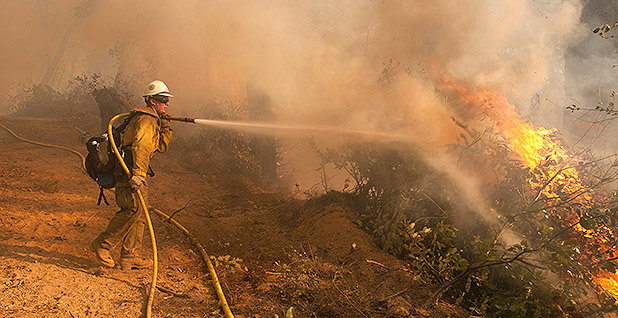 The fund could be tapped when the cost of wildfires exceeds the 10-year average cost of wildfires, which would be set at the 2015 level — an approach pushed by Sens. Ron Wyden (D-Ore.) and Mike Crapo (R-Idaho). That arrangement wouldn't take effect until 2020, however, meaning current law would remain in effect through 2019. An aide described that as a concession made by Democrats. Industry sources who discussed the proposal emphasized that they hadn't seen all the details in writing; the bill was due for release early this afternoon (see related story). Ending so-called fire borrowing would be a major victory for forest policy stakeholders and for the Trump administration. This administration, like the Obama administration, has lobbied Congress hard for a more sustainable way to handle wildfire costs, which now account for more than half the Forest Service's budget. "There are a lot of members of Congress and staffers and partners on all sides of the aisle who worked tirelessly to get an agreement," Gary Schiff, policy director for the National Association of State Foresters, told E&E News this morning. Republican lawmakers who had insisted that any deal include changes in forest management policy appeared to come away with a partial victory. Leaders agreed to ease environmental restrictions on forest thinning in limited situations, these sources said. That would include categorical exclusions from the National Environmental Policy Act for hazardous fuels reduction on areas up to 3,000 acres. Lawmakers also opened the way to more 20-year stewardship contracts, in which the Forest Service collaborates with states on forest management projects. Timber companies would also see an easier process for repairing and rebuilding access roads in some areas of national forests. The agreement also includes language to limit the effect of the 9th U.S. Circuit Court of Appeals' 2015 ruling in Cottonwood Environmental Law Center v. Forest Service. That case forced the agency to consult more closely with the Fish and Wildlife Service on forest projects that might affect endangered species. Overturning Cottonwood has been a high priority for timber interests and also had backing from the Obama and Trump administrations. Negotiators also included provisions to expedite the clearing of trees and brush along utility rights of way, stakeholders said. The measure stands out, as well, for what it doesn't include. Sen. Lisa Murkowski (R-Alaska) wasn't able to secure provisions protecting her state's old-growth timber harvesting, including expanding access to roadless areas. And Sen. Maria Cantwell's campaign for more active forest management in ponderosa pine forests at risk of wildfire also wasn't included. The Washington state Democrat had been working on including that proposal during negotiations with Murkowski and others, congressional aides said.